C4C’s Dr. Clown program is the Czech Republic’s first and original hospital clown initiative – since 1999! SMILES AND LAUGHTER ARE THERAPEUTIC! 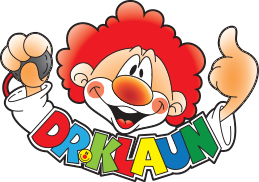 C4C’s Dr. Clown program had its inception in the spring of 1999 and is the original and first hospital clown intiative in the Czech Republic! It is aimed at helping hospitalized children, undergoing aggressive therapies, overcome the trauma of prolonged hospitalization. Inspired by the research of Dr. Hunter “Patch” Adams in the US, Dr. Clown’s team of enthusiastic clowns is working right along side the physicians and staff of children cancer wards and hospitals. Dr. Adam’s work and research attained world wide fame and was immortalized by the movie “Patch Adams”, starring Robin Williams. Cheers, smiles, and laughter follow our teams of clowns wherever they go. Their therapy of laughter is aiding the natural healing process of their little “patients”. It helps them forget their sometimes life-threatening diseases and the strange hospital environment they find themselves in. That laughter is one of the best medicines is certainly not a new discovery. Age-old proverbs like: “a merry heart does good as medicine” (Proverbs 17:22) attest to this. It has been fairly recent though, that laughter’s therapeutic value has been documented by many serious, scientific researchers in this field. The Dr. Clown team is made up of certified hospital clowns and helpers dedicated to the idea to aid and assist children in their fight against sickness and disease. The Dr. Clown program and its continuation depends largely on the generosity of companies and individuals like you. You too can actively help to ease the load of hospitalized and institutionalized children and bring a little happiness and laughter into the confining walls of their clinics by becoming a friend of the Dr. Clown program. supporting the Dr. Clown team financially. It just takes a 500 CZK donation to send one of our clowns to administer Dr. Clown’s “Smile Therapy” to needy patients, suffering from the “Hospital Blues”! – educational materials, books, etc. advertising Dr. Clown to your friends, co-workers and associates, etc. Taking into consideration the weakened immune system of children recuperating in cancer wards and undergoing chemotherapy treatments, which require semi-sterile surroundings, we can only accept new items.